The faction system is getting a major overhaul! Read on to find out more! The Faction UI has received a complete makeover! Here, you’ll be able to handle diplomatic relationships (Allied Factions) declare Cross server and same server faction battles, set Officer permissions and more! Level Limit – If a Level Limit is not entered, the rest of the info will be disabled. If a slogan is not entered, a default message will be displayed. Recruitment posts last up to 30 Days and will expire after that. Faction Management can manually cancel Recruitment posts. Players who do not have a Faction can open the Faction menu (Default G) and enter this menu. 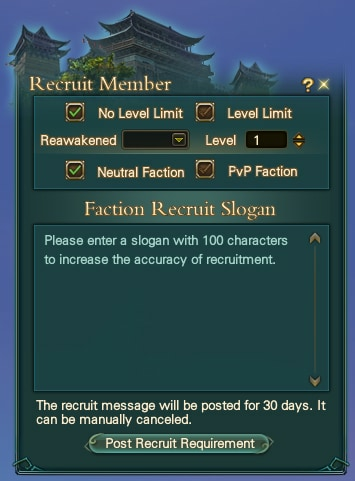 If you do not meet the level requirement asked for by a Faction will not be able to see Recruitment information. Each player can apply to join a maximum of 10 Factions per day. However, a player can not send more than one Join Faction Application to the same faction on the same day. When Factions receive applications, a red mark will appear on the Application button. The list of Applicants are sorted from High level to low level by Default. If a batch approval will exceed your factions Max Cap an error message will appear and applications will remain on the list. When Applicants have been recruited by another faction, a message will be displayed and then they will be deleted from the list. 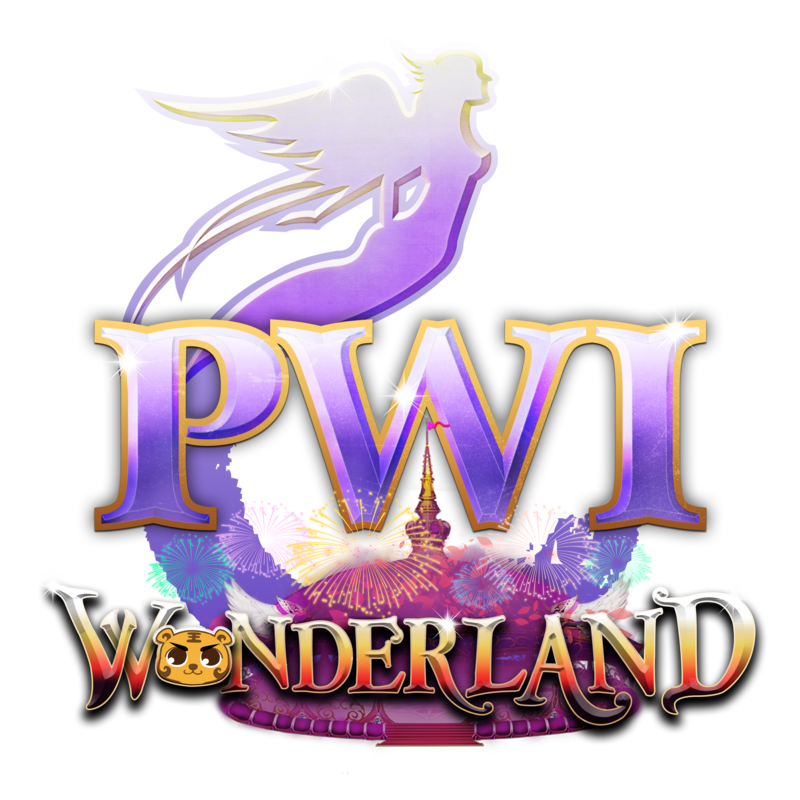 During a batch approval, available players will be enlisted and the rest will be deleted. Max amount of Applications a Faction can receive is 300 – more can be received after the current ones have been processed. At the top right, you’ll see a whole new line of buttons. Member Info, Policy, Declaration, Faction Goals, Faction Welfare, Faction History Record, Faction Privilege Settings and Close Menu. This menu allows you to manage your Allied and Hostile factions. 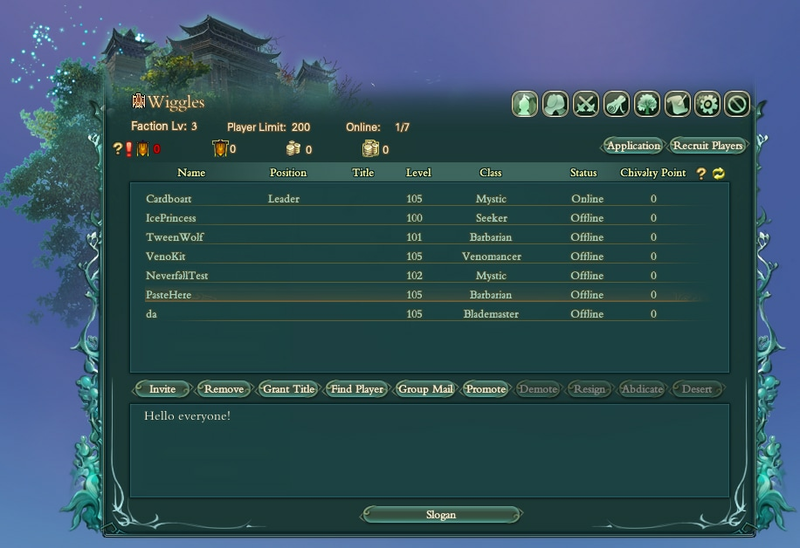 Battles for Server wide Faction battles as well as Cross server can be initiated from this menu. 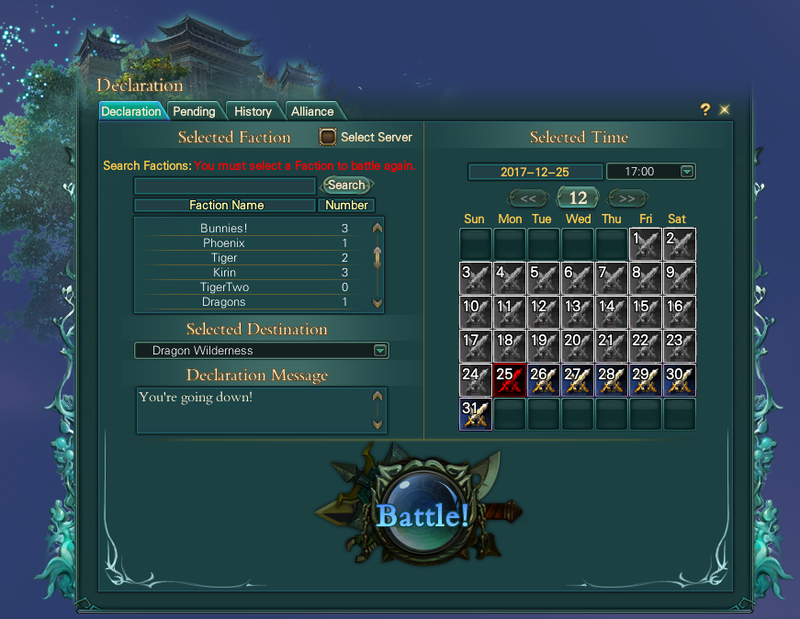 Checking the “Select Server” box will bring up the Cross-server Faction names to battle. This menu tracks the factions weekly goals for completing specific instances. 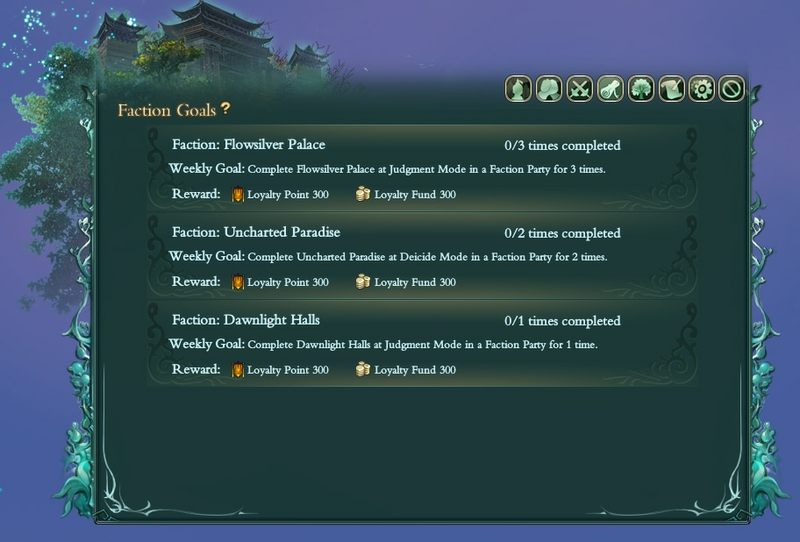 For the Weekly goals to be counted as “completed”, you’ll need to make sure you’re in a Faction Party. 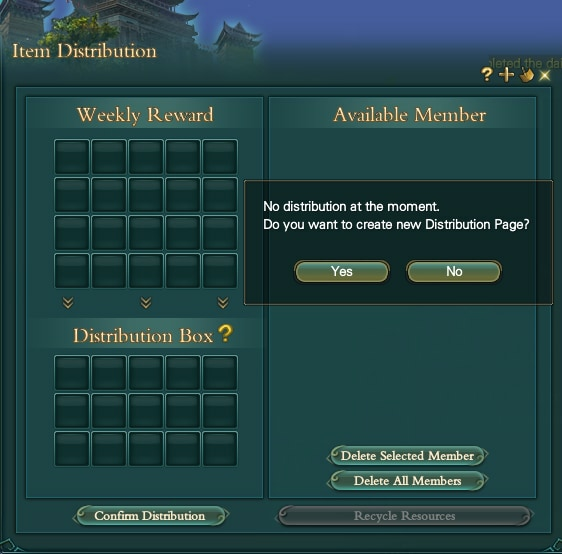 When Faction Leaders don’t have any item for Distribution (no Distribution page), there will be a prompt to ask if they want to create a new Distribution page. Click yes. This week's reward will be displayed at the top, including Instance rewards and the items traded with Faction Fund. Faction Leader can add items from their bag to the Distribution area. When the Leader choose to Confirm Distribution, there will be a secondary confirmation prompt. If you delete a selected member, the items they already collected will not be returned; any uncollected items will be returned. If the items are from the Leader's bag, they will be returned to the Distribution area. You can add new page with the button in the upper right corner. There are a max of 10 pages. When the leader clicks tries to add a new page past the 10 limit, there will be an error message. Deletions need to be made before new pages can be created. The Leader can selected the recipients from a member list, or search by name. Double click a selected member to remove. Double click a name in the member list to add it to selection. You can select multiple players to add or delete. All members will be sorted by their online status. Name, Class, and Online status will be displayed. 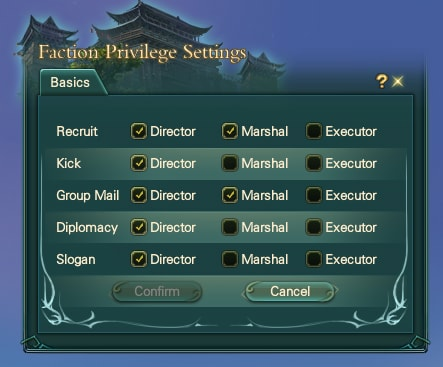 There are some filter options (Faction Position and Class) and a Custom Group function. When adding a Custom Group, the Leader can enter a name for the group. If no name is entered, a default name will be used. When all selections are done, you can create a new distribution page. The Faction Leader can add items to the distribution page from their bag or the reward pool. 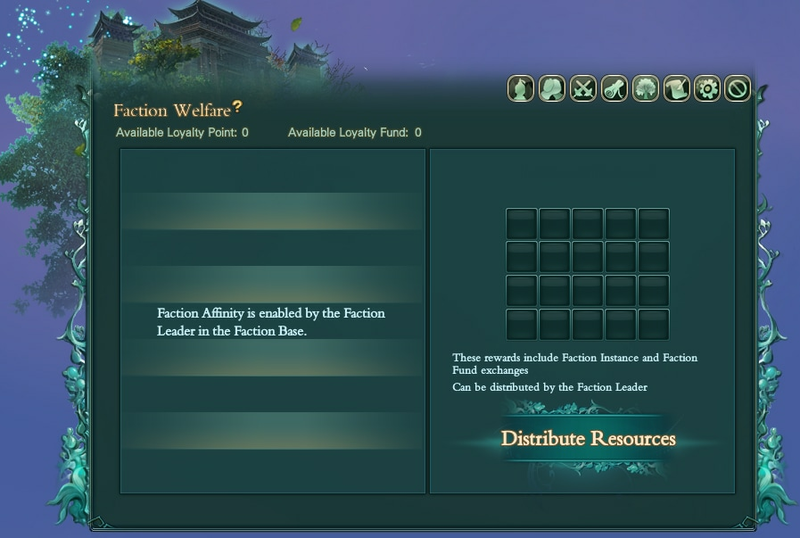 When the Faction Leader is adding rewards to the distribution page, they need to enter the distributed quality for each item per recipient. When there are not enough resources to distribute, there will be an error message. Whenever there is a distribution available, an exclamation mark will pop up in the center of the screen. Click it to open the window. 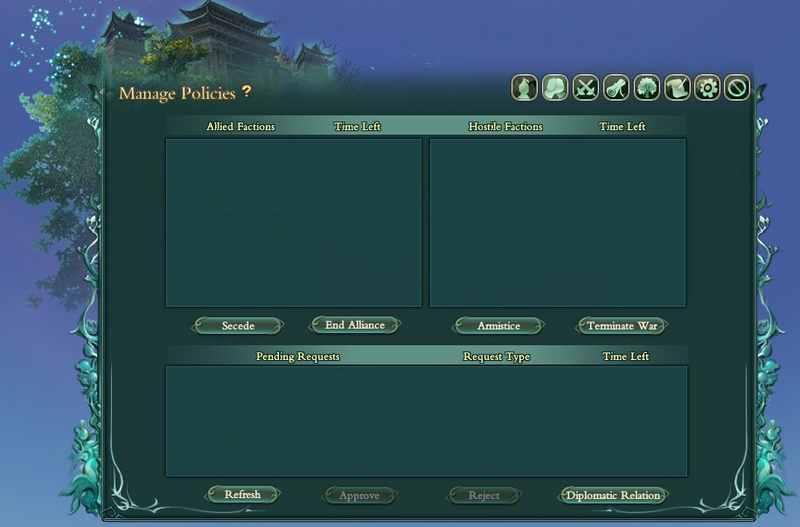 If the player is currently offline, the pop-up will be displayed when he gets online. 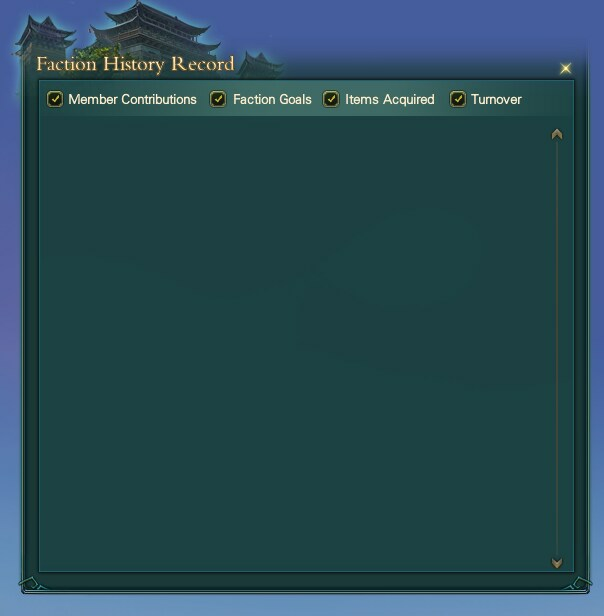 If the player didn't collect the distribution, the prompt will not shown again, but he can still collect the distribution by opening the window from the Faction menu. A stack of items can only be withdrawn at the same time; you can not collect them in multiple batches. Click Collect All button to collect all. When the Faction Leader has deleted a member from the list, the item he has already collected will not be returned, while any uncollected items will be returned. The Faction Leader can recycle these items by left clicking on them. Only uncollected items can be recycled. If the items were added from the reward pool, they will be returned to the reward pool. If the items were added from the Leader's bag, they will be returned to the Leader's bag. When all items in a page are collected or recycled, the page will be deleted. Here, officer settings for higher ranking members can be set. 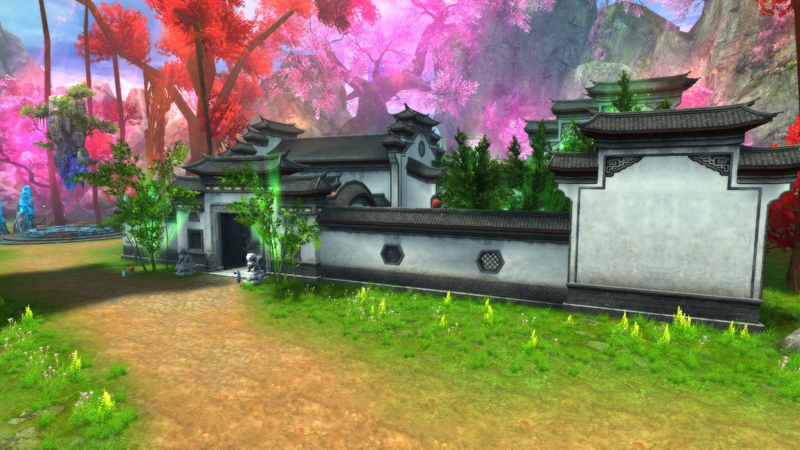 Rong Utsin, the Dragon’s Conquest NPC, is also relocated near these NPC’s! The Faction Base, both visually and functionality-wise, has had a complete overhaul in this expansion! Stay tuned for the next Feature Spotlight that will detail all the new changes that have come to the Faction Base system!